We’ve come a long way since synthetic fibers were developed, and polyester, nylon, polypropylene – even Kevlar has revolutionized our ability to explore extreme environments in unpredictable conditions. We don’t use natural fibers for climbing anymore. If you still do, just watch an adventure movie involving a hero, a damsel in distress, a cliff, sharp edges, ominous close-up shots of fraying rope and dramatic musical flourishes to understand why we prefer synthetic. Natural fiber ropes are nowadays exclusively used by John Snow and his Wildlings to climb their Wall. You need to look elsewhere to find the modern version of the best climbing rope on crags and mountains! Climbing ropes are available in different materials that suit different purposes. Keep in mind that the material you choose could be more expensive than you bargain for, so pay attention to what you’re going to be using your climbing rope for. Polyester: very UV-, abrasion- and heat-resistant, but is not as strong as nylon. The low elasticity makes it hard to untie knots, so it’s good for using as dock lines and hammock guy lines. It’s great for carrying the weight of one person, but don’t try to overbear it. Polypropylene: cheap, strong and rot-resistant but not abrasion-, heat- or UV-resistant. It’s safe for use around water like buoy moorings and net lines, but don’t leave this rope hanging on a cliff face for months, as UV exposure will weaken it. The lack of stretch memory means that once it has been extended it won’t return to normal size. Kevlar: extremely strong, resistant to flame and temperatures up to 160 degrees Centigrade, becomes stronger at subzero temperatures, won’t rust in water, and is resistant to chemicals and cutting. As it has no stretch at all, you’ll use it where you need absolute stability such as mooring and winch lines, or in extreme temperature variations. Don’t leave it out for too long as UV rays will damage it. Nylon: highly UV- and abrasion-resistant, durable, and very strong. Nylon won’t rot and will maintain its smooth surface after carrying a lot of weight. Nylon ropes are very dense, and although they will lose up to 15% of the original strength when wet, they are suitable for pulleys, towing lines, and anchor lines. The way the rope is constructed could make a big difference to its strength, surface, durability, and stretch and will, of course influence how you can use it. Braided rope: Single or hollow braided rope has a woven core. A double-braided rope is a combination of two single braids (one braid inside the other), which makes it stronger than a single braid. This method is used to make polypropylene, polyester, and nylon ropes, where the inner braid is picked for its strength and the outer braid for its resistance to abrasion. Twisted/laid rope: Three twisted strands create a spiral look with a slightly bumpy and relatively bulky finish. You can splice it easily, so it is handy to keep around for a multi-purpose rope, but it is harder to grip and knot than braided rope, and is notorious for kinking up. Kernmantle: A combination of polyester and/or nylon in a core (kern) of twisted fibers and an outer shell or jacket’ (mantel) of braided rope. A kernmantle design is strong, durable and abrasion-resistant but has a good stretch, just perfect for rock climbing. Rock climbing ropes must stretch just enough to prevent the sudden rebound from a fall damaging a climber’s spine. Static ropes look and feel quite similar to dynamic ropes but are used for different purposes. If you use a kernmantle construction, you can make a rope that will take a sudden load without stretching by reducing the number of twists you make to the core strands. This rope will elongate under a fixed load, but won’t stretch against a sudden weight. Static ropes are used as fixing ropes or to pull up loads but are never used to belay. Safety rating: The UIAA (International Climbing and Mountaineering Federation) assigns specifications after conducting some rather extreme ‘fall tests.’ Never purchase a rope with a rating lower than UIAA 5 (5 falls). You want this number to be high! Impact Force rating (Kn, or kilonewtons): The amount of force exerted on a climber during a fall. High impact force can injure the climber as it jerks at his rigs and spine. You want this number to be low. Stretch or elongation is measured both in static (when weight is gradually added) and dynamic (when a load drops abruptly). 7-10% or higher is common for static elongation. You want the dynamic elongation percentage to be higher to give you plenty of cushioning if you fall. Single, Twin, and Half dynamic ropes each have their own application and strengths. Twin and Half ropes are usually skinny, lightweight ropes. You do get ropes that have been UIAA approved for all three categories, however, when a rope is strong and heavy enough to be classified as a single rope, the weight advantage is lost. A single rope system is very common, e.g. sports climbing is done with a single dynamic rope. Each single rope used on the climb must be rated to hold multiple falls. A twin rope system is a slightly clumsy system where the leader will tie into two separate ropes, and will clip both ropes into every piece of gear. The two ropes effectively become a single rope. It is not intended that one of the ropes should catch a fall by itself, but the combined strength makes it safer. Half ropes are skinnier that single ropes but still rated to hold a fall on their own. The leader, who is tied into both ropes, must alternate clipping each piece of protective gear with one of the two ropes they are tied into, to create a backup. If the first rope fails, the climber will be caught by the second. Rope weights are measured as g/m or gram per meter. Although logic says thinner ropes should be lighter, this is not universally true. Manufacturers now use the same amount of material to manufacture thinner ropes, but then knit the sheaths a lot tighter to reduce the diameter. Different manufacturers also have different measuring standards, and two 10mm ropes of various manufacturers are unlikely to feel or look the same. Remember that two ropes may be listed with the same diameter, but when you take the weight into account, the heavier one may be stronger, and they will feel entirely different in hand The lighter and skinnier the rope, the shorter its lifetime. Skinny and Alpine ropes: thinner than 9.4mm, lighter than 55g/m. Rope markings are a safety feature that serves as a visual reminder to let you calculate whether you have enough rope to complete the intended maneuver, e.g., lowering or scaling. The middle is marked with a bi-pattern or reverse weave during the manufacturing process or can be marked afterward. Most manufacturers can apply water repellent coatings to either the core, the sheath or to both. Dry treatment serves two functions. It reduces friction for smoother handling, and it keeps the rope dry (ropes can lose 10 – 30% dynamic strength after soaking). You will be literally entrusting your life to your climbing rope, and this is not the place for false savings. Spread the rope in large loops and dry away from UV and heat sources. Use a rope bag. It prevents particles from getting into the rope which will accelerate wear, and the stacking reduces twists which remove the need for coiling. A car trunk is not the best storage – avoid extreme temperatures and conditions. Treatment: Dry treated core, outer sheath or both plus a standard (non-treated) option. Best Use: The Evolution Velocity is a great buy for novices or people who only need one rope, but offers solid value for any climbing discipline and level of experience. You can tackle rough climbs, sport, trad to steep ice and mixed routes with it and expect a long rope life with excellent handling. Description: The Velocity is a very popular sub-10mm all-rounder rope. It offers great handling, smooth feeding through belay devices and a soft catch. The high sheath percentage and smooth finish reduces rope drag and makes it very durable. It is not the lightest rope in its category, but it performs very well in a variety of environments for an affordable price, which makes it a good value all-rounder climbing rope for many enthusiasts. Best Use: Classic mountaineering, sports climbing. This ultra-light and very thin rope is made for elite climbers on challenging routes. Description: There is no need to shake out or prepare the Petzl Volta rope; the specific coil allows you to use it straightaway after unpacking without the danger of kinks. The Petzl UltraSonic Finish method bonds the core and the sheath together at the ends with an ultrasonic process to avoid frayed ends. 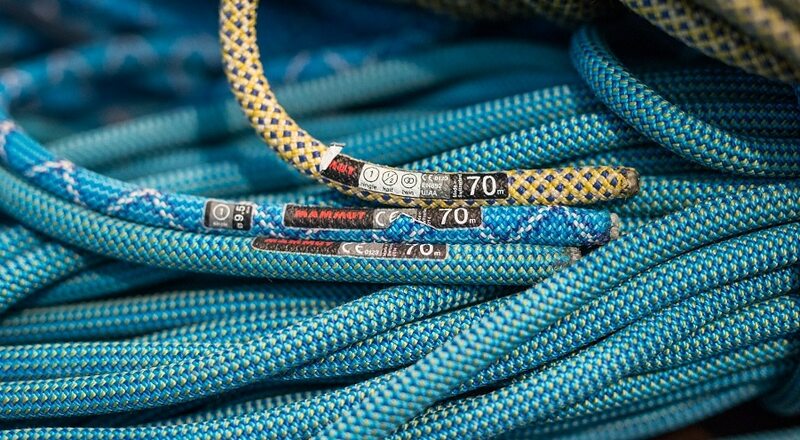 Petzl has also developed some brand-specific treatments for their ropes which certainly adds to the fine qualities of this rope. These are the Duratec Dry water and abrasion resistance treatment, and the EverFlex thermal treatment which stabilizes the inner core strands. The treatments improve consistency for long-term handling in extreme conditions over the lifetime of the rope, provides excellent grip and ensures that the rope functions smoothly in belay devices. The middle mark allows for efficient belaying, and the rope can be used as a single, half or twin rope. Treatment: Infinity Classic receives no treatment. Treatments for the Infinity Dry include core and sheath. The treatment changes specifications. Best Use: It’s perhaps a little thin to be an all-rounder for beginners, but intermediate and advanced climbers love this rope on multi-pitch climbs, crags, long approaches or sports climbing. Description: The weaving method makes the Mammut Infinity feel a little thicker than other makes of ropes with similar sizes, and the sheath also appears to be looser than most ropes. However, its weight is the same or less than other 9.5mm ropes, and it handles extremely well. It is supple and feeds smoothly through belay devices. The high sheath proportion and the dry treatment ensures high resistance to abrasion and prolongs the lifetime of the rope. The Mammut Infinity Dry is a beefy workhorse rope that happens to be light enough for sport and alpine climbing – the perfect combination of exceptional handling, durability, and low weight. Treatment: Pro Shield, Dry Shield, Thermo Shield. Best Use: The 9.5mm diameter makes it an all-rounder, and the handling makes it perfect for novice and elite climbers alike. Recommended if you only need one rope for your usual climbing activities. Description: The handling is extraordinary. The Edelrid Eagle Light feels smooth, supple, and agile whether you are tying in, pulling, clipping, belaying, coiling; the Edelrid Eagle Light is a pleasure. The diameter makes it a versatile rope, it is fairly light, and the smooth handling makes it stand out as an all-rounder rope at a decent price for such a high-performance rope. While it is not the most durable rope in this category, nor the lightest, the outstanding feel and handling might compensate for that. Category: Alpine/sending, not quite an all-rounder. Treatment: with or without a DryCoat treatment. Best Use: Intermediate and advanced climbers who already own a light workhorse but need a skinnier or more lightweight rope for advanced climbing techniques. Description: The Sterling Rope Fusion Ion R 9.4mm Rope is the thickest rope in the Fusion series, but the construction makes it a very high-performing lightweight rope. The sheath is very tightly woven which makes it relatively expensive, but also prevents sheath slippage, provides better handling, less rope drag, and less strain when belaying. It is a very light-weight rope with excellent handling and feel, and a good soft catch. As always, there must be a compromise between weight and durability, but as the IonR isn’t meant to be a workhorse, it gives an excellent performance as a low-weight rope in demanding environments. Best Use: Fun climbing on difficult single pitches for experienced climbers, or alpine climbing. The very small diameter makes it unsuitable for beginner climbers and top-roping, as the rope is so thin that you must take extra care. Check that belay devices can handle 9mm rope before you commit yourself! Description: This featherweight Sterling Rope Fusion Nano IX Dry Climbing Rope may not be the most durable rope due to the 27% sheath proportion, but it is an absolute climbing pleasure. The tight sheath reduces rope drag and makes it feel even thinner than it is, offering incredibly smooth handling and suppleness. The very low weight makes it ideal for long objectives and alpine climbing. It is sold drum-coiled and should be uncoiled properly to prevent kinks before your first use. The Nano IX has an ultra-slick feel straight out of the package and needs a short breaking-in period, but once it has settled down, you can expect incredibly smooth feeding and flexible handling. However, as Sterling has decreased sheath density to reduce weight, the Nano IX is inevitably not highly abrasion-resistant, and although the tight weave holds up better than the 27% sheath proportion would suggest, it is best to avoid harsh use. It is a specialist rope which offers the weight saving sometimes necessary to attain specific goals, as well as a soft catch and fantastic handling. Best Use: This relatively heavy workhorse rope will take you from the gym to redpoint and bigwall climbing and will outlast most other ropes on coarse surfaces. Great for beginners who take a lot of falls. Description: This incredibly popular Sterling Rope Marathon Pro Climbing Rope can be found in many gyms where they are a durable and reliable companion for novice and advanced climbers alike. Although the thicker diameter means that it does not feel as supple or handle as smoothly as thinner ropes, it behaves very well in belay devices and will maintain its performance long after thinner ropes have become stiff and unpleasant to handle. The very high sheath proportion features a loosely woven, double-pick braid which makes the rope heavy and bulky, but provides unmatched longevity and justifies the high price as it will outlast almost every other rope out there. Now that we’ve had a look at the features and pros and cons of different ropes, it may be hard for you to watch your next adventure movie without sizing up that climb our hero has to make against overwhelming odds.